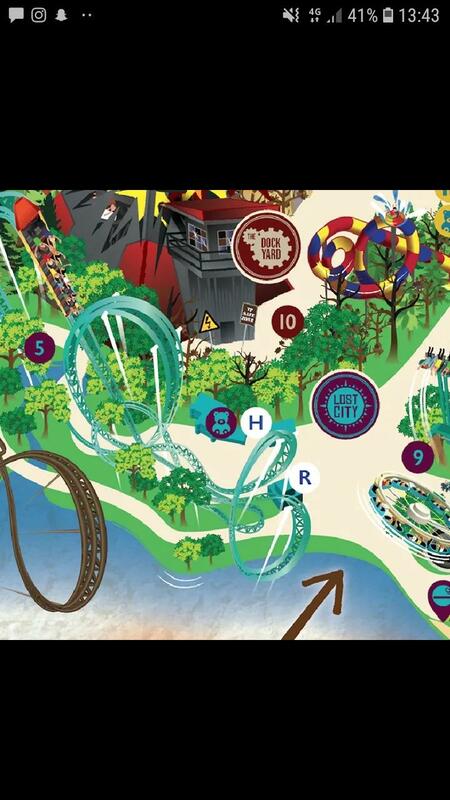 This is the second teaser they've shown with an arrow pointing to part of the park. The first pointed to IAC, which we can assume is for Jungle Escape. Could this arrow be a location for BounceZilla? The area next to Crust can fit a lot in, and probably the most suitable place on park for it.. I put the two teasers they have posted together (forming the centre of the park) the arrows seem to be indicating the locations for the events this year; I could be wrong. However it’s interesting how ‘Old town’ appears to be deliberately left out, could they be labelling this area as “under construction for 2020” or simply because this area hasn’t got much going for it at the moment? Old Town is still to the left out of shot. It looks like the arrows are showing where the events are. Definitely seems as if they're hyping the events. At least they're sticking to their guns and actually have a consistent marketing plan I suppose. The Swarm won't be running with 2 rows backwards. Just an old graphic it seems. It's more likely 'Bouncezilla' is a code word for Loggers Leap and it's now reopening this year than Swarm going backwards tbh. That Swarm image has been used since 2013. It's pretty much the best photo they have of Swarm doing it's drop. People tried drawing the same conclusion about mrawS returning for Fright Nights 2017 when they used it for that artwork. They probably should consider updated their image library. -It feels like there's less options on Exhilarate now? It's not going to be a coaster or a new ride. 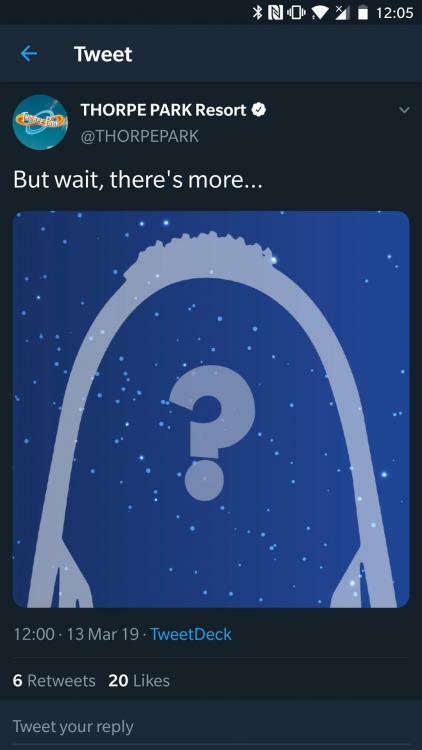 My money's on another event they haven't announced this year/ already hinting at 2020 seasons' events: Reaching new heights or something else Stealth related? Presumably to make up for lost money during the GameFX period? Also, why are people complaining "oh, they're doing nothing special for their 40th birthday!"? Is 40 special or something because technically every year is their birthday or is it just 40 is a nice divisible number? People tend to celebrate 30/40/50 as bigger milestones than 37 years old. We have more information about GameFX and Thorpe Park echo my point to people about criticising an event you haven't tried. Speculation time. Like Ringo says, 10s are reasonably nice anniversaries to celebrate. They don't have to do anything, but it's always nice. This is particularly highlighted with them mentioning it in adverts for the Thorpe Annual Pass. Furthermore, with other parks celebrating anniversaries as a common thing (Efteling, Disney push their 5 year anniversaries, Towers have done stuff for Nemesis and Oblivion), it can lead to public demand for anniversary celebrations. I mean, we know they've mentioned VR will be there, and there'll be some upcharge features. VR gaming isn't that common, and the upcharge stuff almost definitely won't be stuff available to play at home. And retro games (probably stuff like Pacman arcade machines from the 80s) aren't common in homes. So I wouldn't read too much into it. I think some of the questions being raised are fair. This is being pushed as a big thing, when at best, it should be a side addition to expand the line up. And the worth of that sort of event when the park needs to improve its offering and get more people in in the first place is questionable. Then also why people would go to Thorpe for this when there's hundreds of locations they can do this. I highly doubt that, as this has been on there for the corporate events they offer for companies etc. They were offering this over Christmas in 2018, so I don't think this is related. They offer the fastback (q-jump) to the corporate packages. Also I would say they look more like stars than snow, sorry to disappoint! I think it is most likely going to be summer nights returning, but again I could be wrong.